Susan tells us How to Raise Thankful Kids in an Entitled Culture. Nannette writes about The Dust I Can’t See. Kaylene shares 4 Ways to Get Through Hard Times. We don’t like to think about the awful things that could happen to our daughters, but in this day and age, it’s a conversation we need to have. I saved this iMom article 7 Threats to Your Daughter’s Physical Safety to discuss with my girls, especially now that our oldest drives and both of them often go places without me. If you’re already thinking ahead to Valentine’s Day, you may want to revisit my list of 14 Ways to Celebrate Valentine’s Day with Your Kids. While I’m in the middle of a couple of books now, not much happened on the reading front in January! In non-fiction, I actually finished Cozy Minimalist Home by Myquillin Smith right at the end of December. This was such a practical home decor book – and don’t let the word “minimalist” scare you! Myquillin doesn’t say you have to get rid of everything you own. Rather, she emphasizes making your home work for the way your particular family lives, keeping things simple and clean, shopping your house, and learning when you have enough. It’s a simple formula for even this decor-challenged person! In fiction, I read Death Wears a Mask by Ashley Weaver. It’s the second in the Amory Ames Mystery series. I think I liked the first one better, but this one also kept me guessing “who-done-it” until the end. 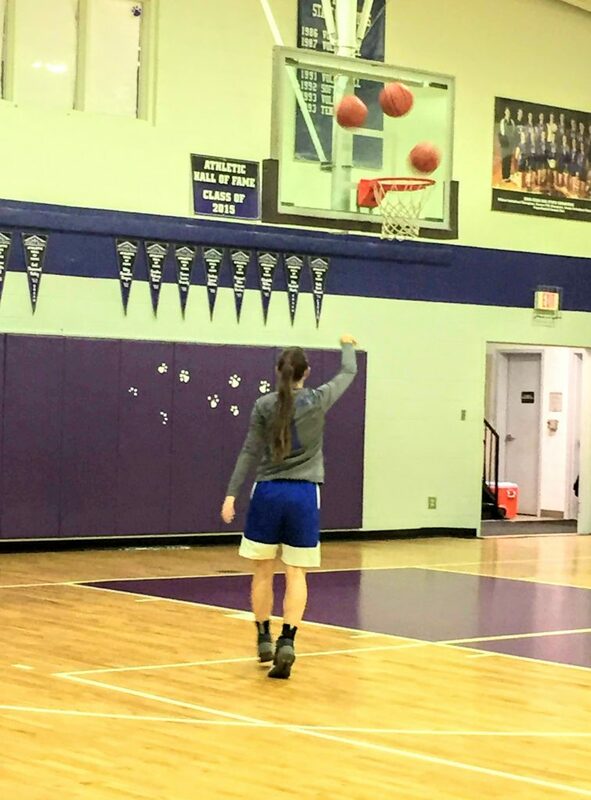 This girl played her last regular-season home Varsity Girls basketball game last night. So I’m writing this post on Friday morning. 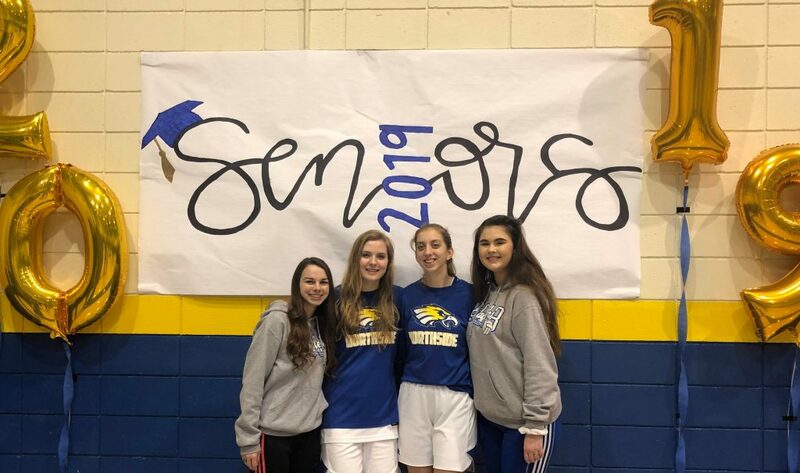 Tonight our younger daughter, a high school sophomore, will play for the last time on the JV Girls basketball team (she’ll only be eligible for Varsity next year). Then our older daughter, who’s a senior, will play her last regular season home game on the Varsity Girls basketball team. All that to say, lots of feelings and emotions to process for this mom! Brenda says Ride with Your Hands Up. Dave writes about The Best Day Evaa. Jessica tells us How to Help Your Kids Focus on Faith During the School Year. Raluca lists 40 Family Night Ideas to Try with Your Kids. I’m such a fan of family traditions, which led me to share Jessica’s post 10 Awesome Weekly Traditions for Your Family. Taking my younger daughter shopping today, then meeting up with one of her friends so they can prepare for Spirit Week at school next week. From past experience, I know that Spirit Week requires at least one trip to Goodwill for random clothing in weird colors that we wouldn’t normally purchase! 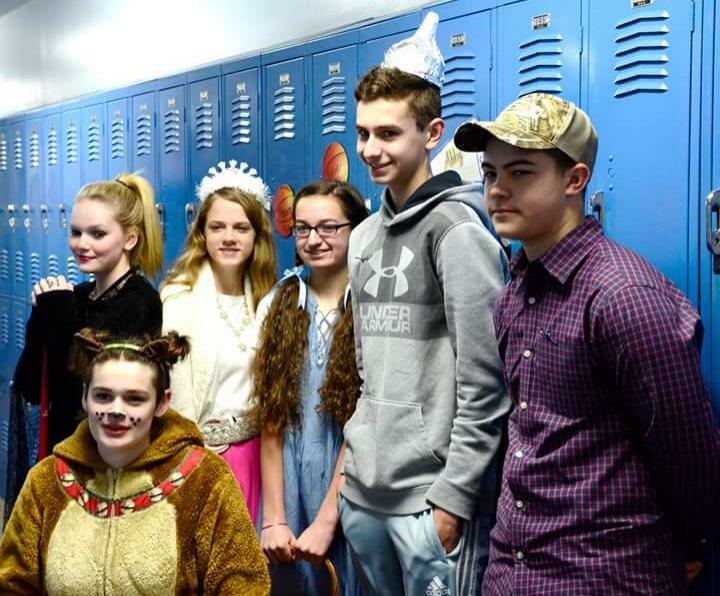 My younger daughter and some of her classmates dressed up as characters from the Wizard of Oz last year. She was Glinda the Good Witch. Welcome to the first Saturday Salutes post of the year! We started 2019 with my older daughter getting all four of her wisdom teeth taken out on Wednesday. Very thankful that the procedure went smoothly, and she’s recovering well. Here are several helpful posts I read this week. Michelle shares Sacred Stories on Mundane Tables. Lauren lists 7 Ways to Keep Your Kids Happy and Beat the Winter Blues. Sarah Joy is one of my favorite Instagrammers to follow, but she also has a blog where she recently shared My Best Farmhouse Style DIY Projects of 2018. 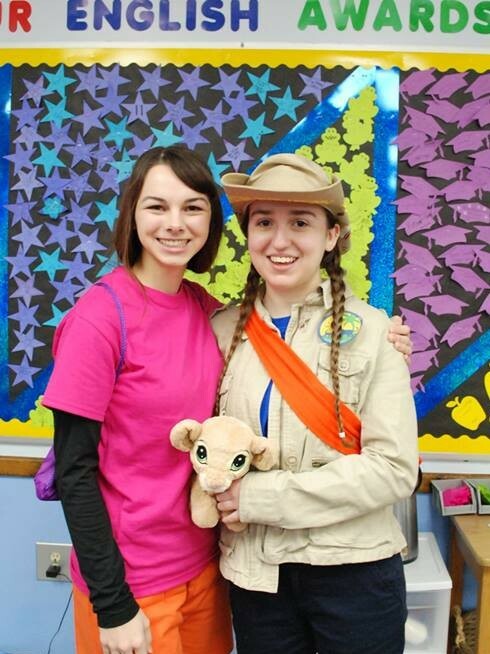 Lara gives us 16 Things Your Teenage Daughter Needs to Hear from You. I think I need to buy some extra bananas so I can try this Chocolate Banana Bread recipe! This graphic from Ginger Harrington has tips to help us in the battle against selfishness. We’re gearing up for our girls to go back to school on Monday. It never feels quite like the new year until we’re back into our regular routine – not that I haven’t enjoyed the break! Hope you have a wonderful weekend!! 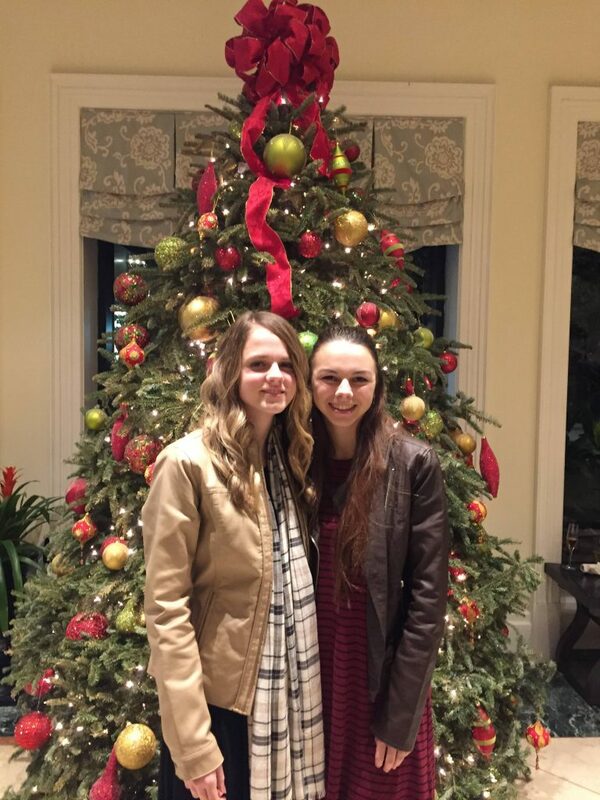 We continued our Christmas Eve tradition of going out for dessert in downtown Charleston and touring the hotel lobby at Charleston Place. I didn’t do much blog reading this past week, so I thought I’d share the books I finished in December, as well as recap the top posts from the blog this past year. I only read one non-fiction book this month. I recommend How to Break Up With Your Phone by Catherine Price if you’re serious about limiting the amount of time you spend on your phone. In the first half of the book, she outlines the issues we often have with our phones. Those include addiction, changes in your brain, the effects of social media, and how advertisers want to program us to be on our phones as much as possible. The second half lays out a plan for being more mindful users of our phones. She doesn’t suggest getting rid of your phone, but rather learning to use it mindfully. Don’t let it be your default when you’re bored, or allow yourself to just mindlessly scroll. There’s a 30-day program in the book, which includes plenty of helpful tips including taking a “phast” from your phone. This was a relatively short book, but definitely helpful. I finished four fiction books this month. Celia Garth by Gwen Bristow is set in Charleston during the Revolutionary War. Nikki recommended this book, and I’d say it was one of my favorite reads this year. It’s an older book, and reminded me of the kind I read as a teenager. Catching Christmas by Terri Blackstock was a quick read that I also really enjoyed. It was a sweet story about an old lady, her granddaughter, and a cab driver. Amy Snow by Tracy Rees was an entertaining book with a nice mix of mystery and romance. The final one is Murder at the Brightwell by Ashley Weaver. It was an Agatha Christie type novel. That’s not a genre that I normally read, but this was another fun book as well. I didn’t publish as many posts here as I have in previous years. Life has felt a bit busier in general, and I’m definitely focusing on making the most of these last years of high school with my daughters. That being said, I do hope to be a little more consistent with my writing in 2019. Here’s a countdown of the top ten posts (according to Google analytics) published here on Girls to Grow over the past year. If you have a favorite post that didn’t make the list, let me know what it was! Hope you have a wonderful weekend as we prepare for 2019!! Alia writes about The Waiting and Hope of Advent. Stacey shares help For the Days When You’re Tired of Living with a White-Knuckled Grip. This is an older post, but a great reminder of 10 Things to NOT Do This Holiday Season. Ann has 9 Cozy Winter Favorites for the Cold and Dreary Season. It wasn’t until we were in New York City a couple of weeks ago that I realized everyone in the family likes bruschetta. I’d ordered it in restaurants before, but this time my husband and daughters ate it, too. Ater we got home, I made The Pioneer Woman’s Bruschetta and it was so tasty!! I’ll definitely be making it again. The video below is from our daughters’ school Christmas concert last week. This handbell song was my favorite of the four they performed. I was sitting pretty far back, so the video’s not as clear as I would have liked. Our daughters are the third and fourth ones in, if you start with the line of girls at the first table. Just one Christmas party left, which is our Sunday School class breakfast tomorrow morning. All of the shopping and most of the wrapping is done, so I’m looking forward to a low-key Christmas Eve day. Hope you have a wonderful pre-Christmas weekend! 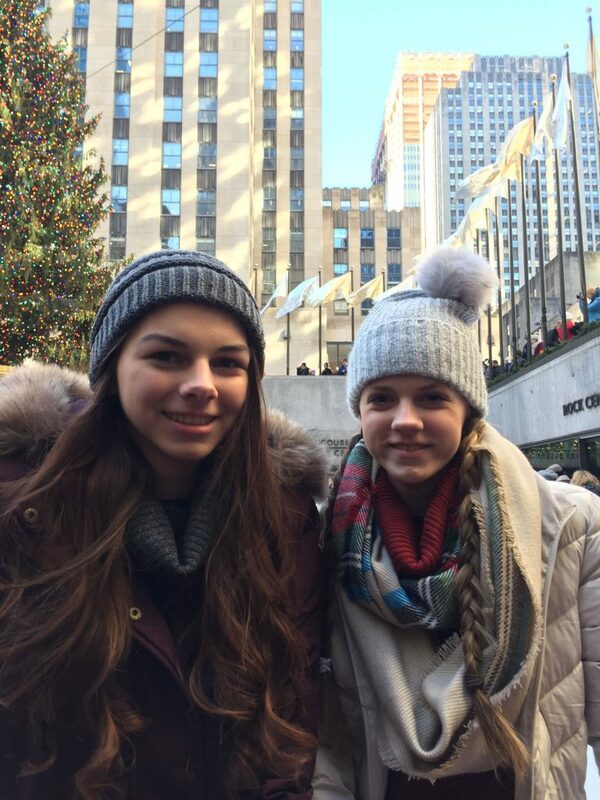 Last weekend we took our daughters to New York City. 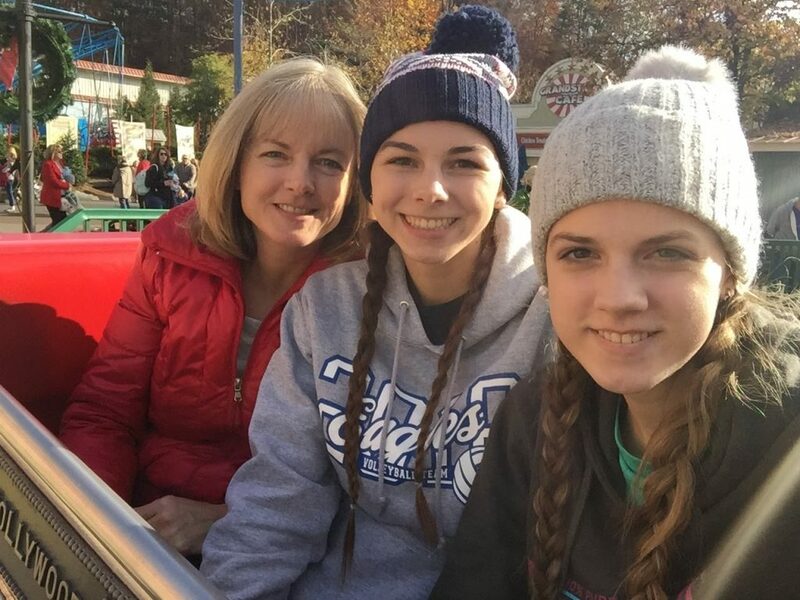 Since our oldest turned 18 on December 1st, and our youngest turned 16 on December 3rd, it was a “once-in-a-lifetime” type birthday trip for them. We’d all been to New York City before, but never at Christmas time. It was nice to see the city all decked out in holiday decorations. 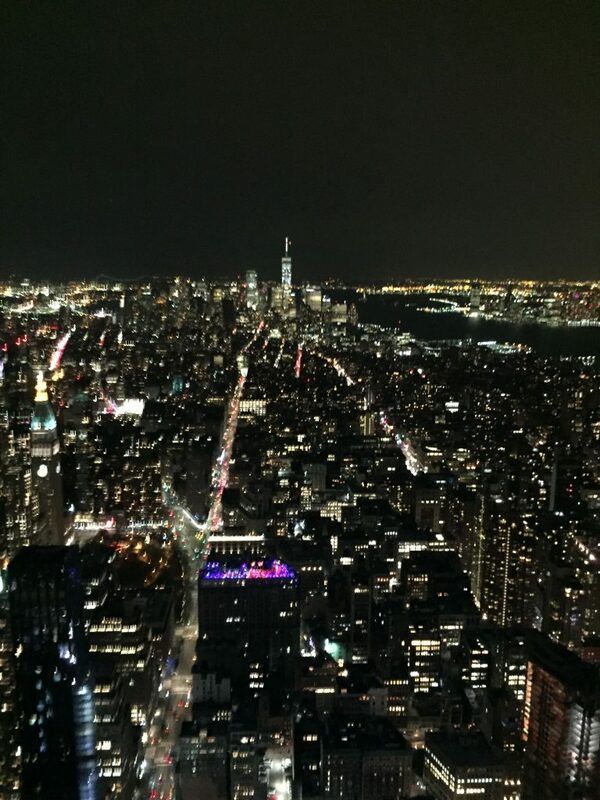 Our younger daughter wanted to go up in the Empire State Building at night, so we headed there after walking around Times Square on Thursday night. Beautiful views, but cold and SO windy! 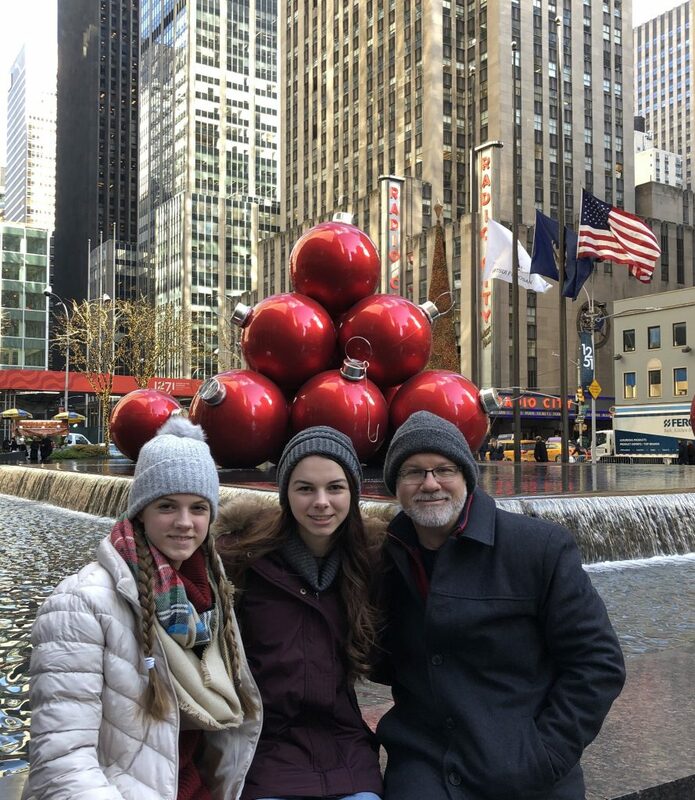 On our way to Rockefeller Center Friday morning, the girls recognized this setting from several Hallmark Christmas movies. We were headed to Rockefeller Center because the girls wanted to go ice skating there. Mission accomplished! On Saturday, we visited Freedom Tower and went up to the One World Observatory. 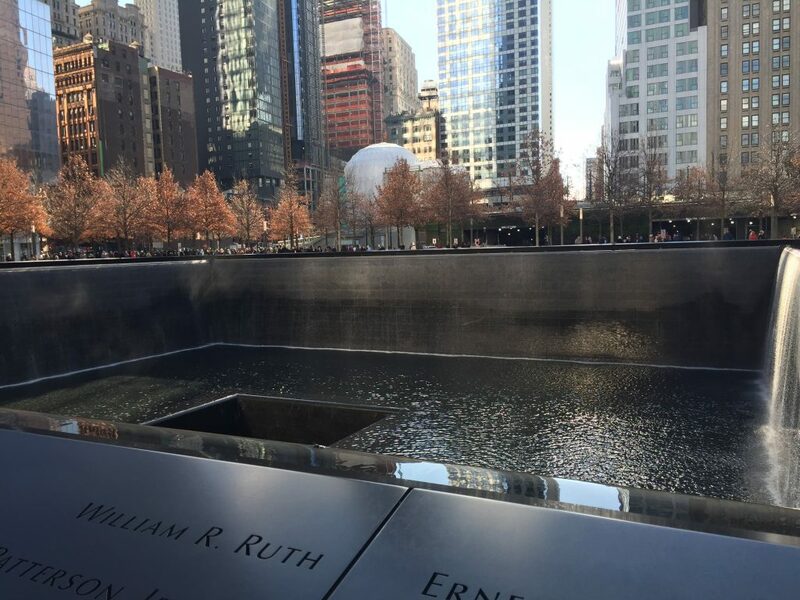 We’d been to the 9/11 Memorial before, but the 9/11 Museum hadn’t yet opened the last time we were in New York. Even though we spent a good deal of time there, I felt like there were still things I didn’t see. It was quite crowded, which made it difficult to navigate through some of the exhibits. That day still stands out so vividly to me, and it was very moving to be taken back in my mind to those events. 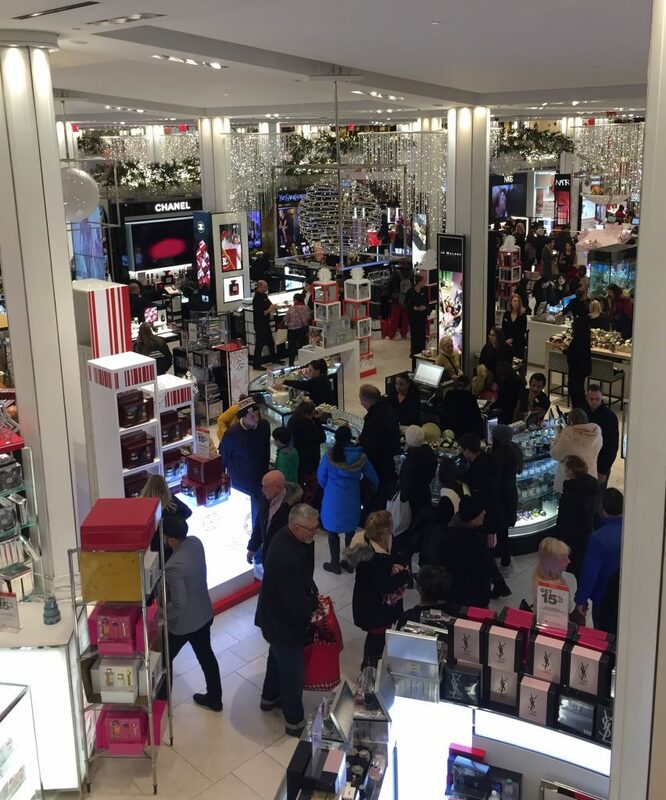 We popped into Macy’s briefly late Saturday afternoon. It was beautiful inside, but what a zoo – people everywhere! We did ride the escalators up to the eighth floor, but no shopping was happening for us there! We also caught a couple of shows, and just had a wonderful time being together as a family. Now on to some good posts I found recently. Cyndi has 10 Small Ways to Bring Peace into Your Home. Sara tells us How to Thrive When You’re in a Season of Waiting. Nancy lists 10 Ways to Enjoy Your Kids During Christmas Vacation. I know a number of families who will be spending their first Christmas without a loved one. Chara shares words of hope in Christmas Mourning. I enjoyed Christina’s Farmhouse Plaid Christmas Tour. 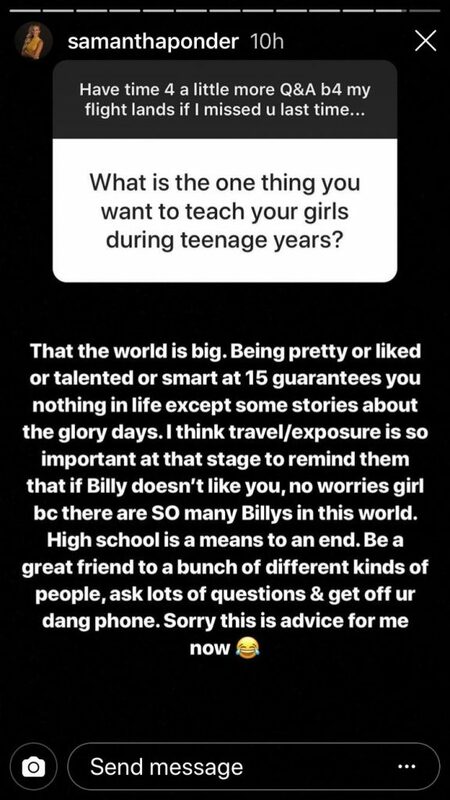 And here’s a bit of advice for teenage girls from Samantha Ponder’s Instagram stories that I shared with my daughters. Here are several good posts I found this past week. Raluca lists 7 Things That Will Help You Enjoy a Stress-Free Holiday Season. Ruth has Ideas for Keeping Christ at the Center of Your Christmas. Joy shares Family Christmas Traditions to Start This Year. Taryn details Quick and Easy Christmas Table Decor Ideas. On a non-holiday note, if you like farmhouse style, you’ll enjoy Rhoda’s post highlighting Big Family Little Farmhouse. 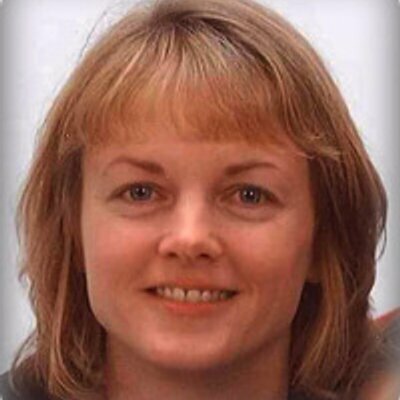 Kate talks about what she’s learned as a mom in Seasons of Our Lives. 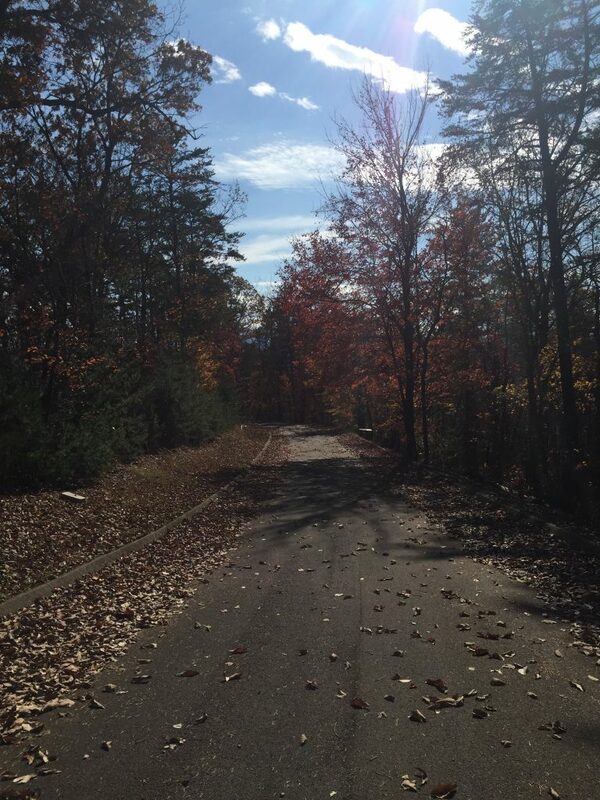 I couldn’t believe how much color was still on the trees in the NC and TN mountains this week. Just beautiful!! Christin tells us The Best Way to Love Your Husband. If you’re planning family photos any time soon, check out these tips from Corina in What to Wear for Family Photos. Susan shares 7 Important Things I’ve Learned About Parenting Over 46 Years. Number seven is one that I often need to remember! 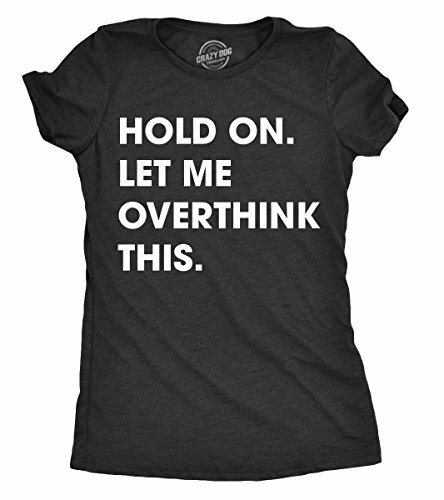 Kara has Holiday Gifts to Give Yourself Now That You’ll Thank Yourself for Later. Tracy tells us How a Professional Organizer Approaches the Holidays. So I read A LOT of books this month. Yay for a weeklong vacation with plenty of time in the cabin! Here were my three non-fiction reads. Remember God by Annie F. Downs was a really good, quick read. Annie is very vulnerable in this book as she shares some tender parts of her story. It was an encouragement to me to continue to trust God whether or not my life is turning out as I thought it would. From Mom to Me Again by Melissa Shultz was a memoir of this author’s first year as an empty-nester. It was an interesting read, though I preferred last month’s “empty-nest” read. Sisters First: Stories from Our Wild and Wonderful Life by Jenna Bush Hager and Barbara Bush was another memoir on my list this month. I enjoyed reading about some of the “behind-the-scenes” moments, especially related to 9/11, and also their memories of special times with their dad. Here are the four fiction books I read this month. I had high hopes for Becoming Mrs. Lewis: The Improbable Love Story of Joy Davidman and C.S. Lewis by Patti Callahan due to lots of positive reviews I’d heard about the book. Maybe my expectations were too high, but it just wasn’t quite what I was expecting. Since this was a fiction book, it did inspire me to do some research into Joy Davidman and her relationship with C.S. Lewis. I enjoyed the mystery in The View from Rainshadow Bay by Colleen Coble. I’ll likely eventually read the next book in the series. Farraday Road and Swope’s Ridge by Ace Collins are the first two books in his Lije Evans series. I got a little lost with all the characters a few times, but overall it was an interesting mystery. Know that the mystery is not resolved in the first book; it leaves you hanging, and wraps up a bit more neatly in the second one. There’s a third book as well that I haven’t read yet. Today is Christmas tree day! We typically go to a home improvement store and pick out a 6-to-7-foot Fraser fir tree. Hopefully I can get it decorated in the next couple of days.